…Only It's Not ALL Downhill! 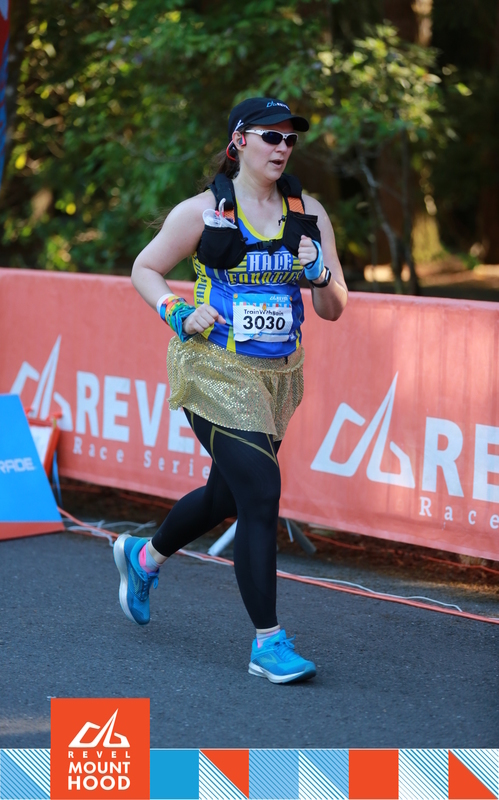 When I say, “this race was tough for me,” what I mean is, “after I ate lunch, walked home from the hotel where the bus dropped off, and showered, I slept for 20 hours.” So I knew I wasn't “trained up” for this race, but I figured since it was a Revel, it would be a lot like the Revel Mt. Charleston half marathon–all downhill. Um, nope. There were three pretty significant hills including a nasty climb up to mile 10. (Yeah, yeah, that's what I get for relying on an infographic instead of looking at the actual course elevation profile.) I'm sure the additional elevation, particulate matter drifting from the wildfires (confirmed via the weather report), and total lack of sleep didn't help. Some idiot in my apartment building saw fit to pull two alarms Thursday night after midnight, and in order to get to the shuttle to the starting line–which thankfully was just three blocks from my apartment–I had to get up at 2 a.m. to get dressed. That's Disney early! When I heard Revel was going to have a race on Mt. Hood, I signed up immediately. (This was at the expo for the Shamrock Run, back in March.) 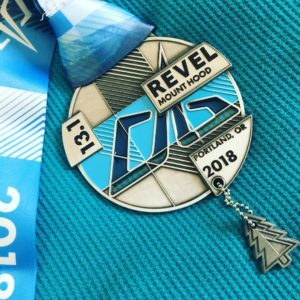 I had great experiences with Revel Mt. Charleston–and I ran the inaugural there, too–so a race in my backyard, ish, was a no-brainer. 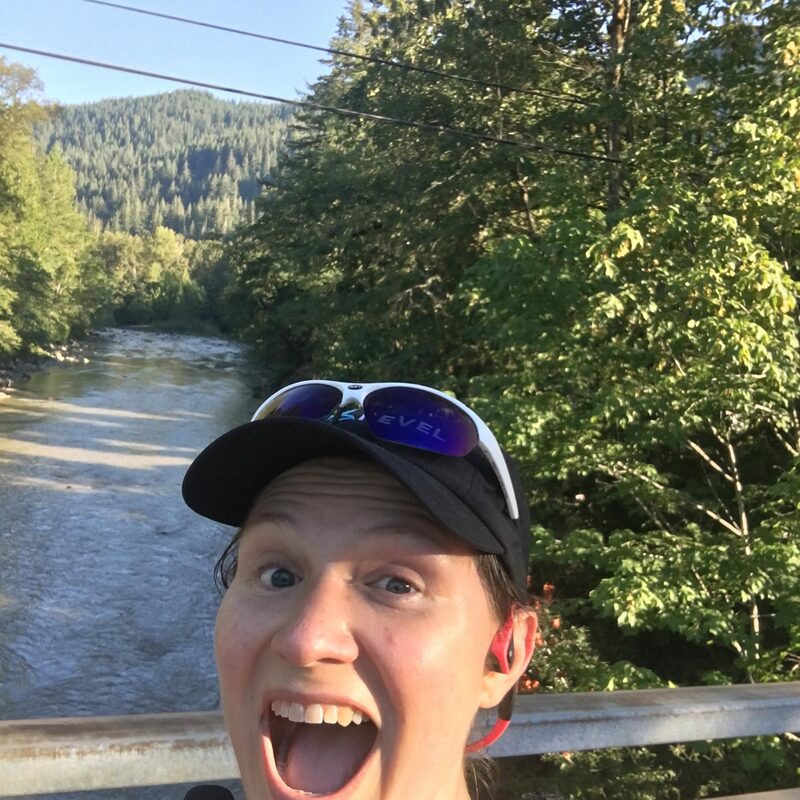 I'm NOT an early-morning person, and the bus ride turned out to be on a school bus, but I was super glad the race started at 5:30 since Oregon is currently on fire and hot as hell. Bling from Revel Mt. Hood! 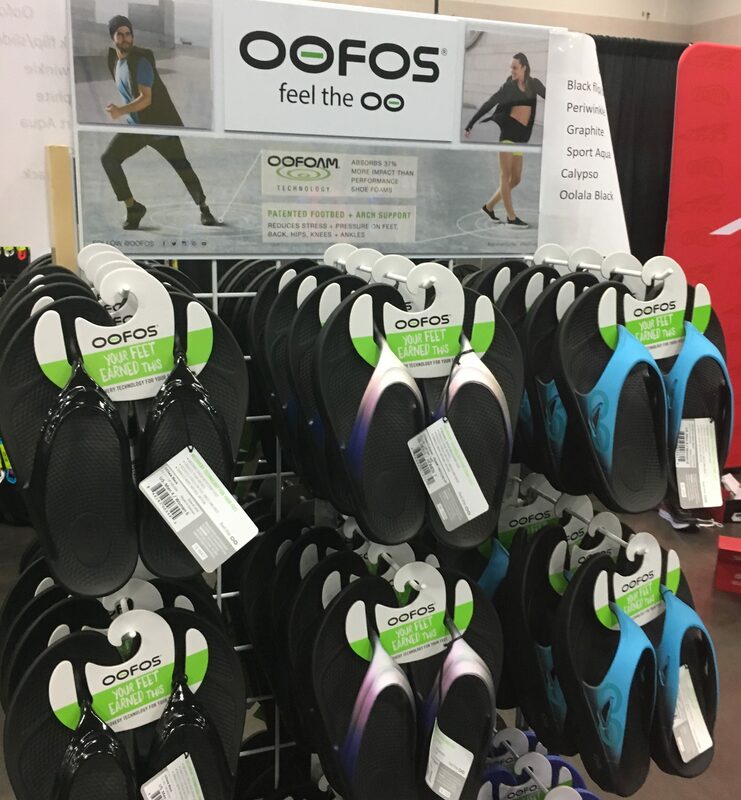 These are NOT “flip-flops.” I am in love, a total convert, and trust me you need a pair. you're not from here” kind of way, this and the hotel from which the shuttle left were called “downtown” Portland in the promo materials.) The only thing wrong with the expo is that there was no signage on the MAX side, leaving the majority of us to either wander through all the halls and discover the Revel expo wasn't in the same hall as the other race expos. Oh, and it was HOT inside, but I blame facilities for that, not Revel. The expo was small, which I think is the norm for Revel. Since I live two blocks away, I went to the expo right at 10 when it opened, to avoid the post-work crowds. No waiting for my shirt and bib, and the volunteers even put the bag-tag on the gear bag for us! I didn't like the shade of purple on the women's shirts as much as I thought I would, so I swapped mine out for a men's shirt. Easy-peasy. 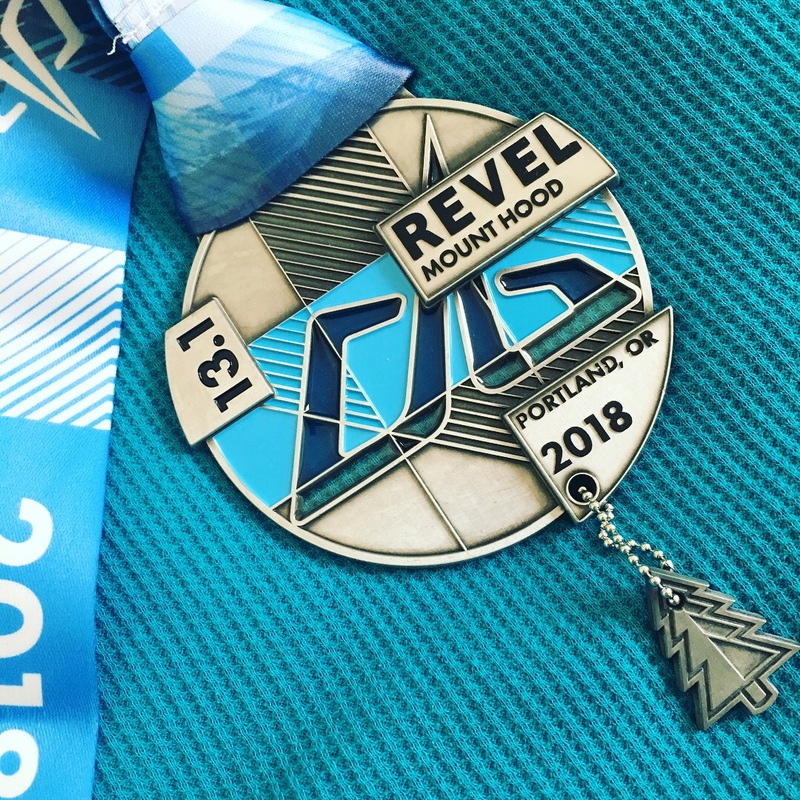 This year Revel partnered with Headsweats, and all runners scored a Headsweats cap with the Revel logo. Headsweats does a great job of drying out quickly, which is cooling (added benefit). A lot of my friends wear their visors, but since I'm two shades lighter than Caspar that would result in a burned scalp. 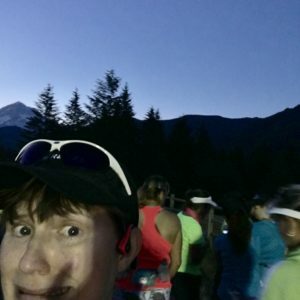 Their stuff is great though, and I had no hesitation about wearing my new Headsweats Revel cap to the race (despite that “nothing new on race day” mantra). Super stoked to see this as a partnership, and I hope it continues into the future. Per usual, the Revel swag bag included a heat sheet (because it's THAT cold at the start) and a pair of gloves (really! ); a G2G Protein bar; coupons for Papa John's (the post-race pizza sponsor), Surf Butta, and LA fitness; and samples of Replaces SR (sustained release electrolyte tablets) and doTerra Deep Blue. Walk over the timing mats on the ground, check the screen to see if your bib works. Smart set-up! 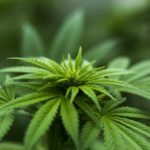 The partnership with doTerra? Ugh. WHY? Yes, THAT doTerra, the essential oil multi-level-marketing company. You know, the one that claims only doTerra has “therapeutic grade oils” (a term they made up that is not subject to any third party overview), the same one that was smacked by the FDA because they had “wellness advocates” making claims about the use for their essential oils that are not backed by the required factual evidence? Yes, that one. Listen, I like nice-smelling things as much as the next person, but I would rather have seen BioFreeze on the course instead of Deep Blue and no essential oils at the expo. Also, neither doTerra nor Revel warned that Deep Blue has almond oil in it–potentially very dangerous for those with nut allergies. Please, Revel, drop doTerra and stay away from MLM companies. The expo, otherwise, had some cool stuff. 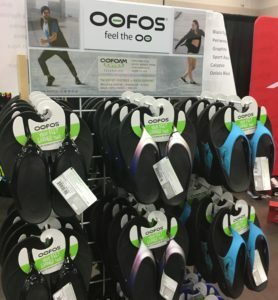 There was a timing line to check that your timing chip worked, small Revel merch store (but none of the Scott James jewelry, boo), a temporary tattoo station, a big ol' display of oofos (hooray! 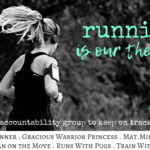 ), and some running-related stuff. 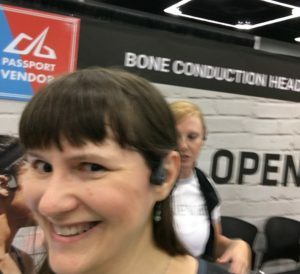 Since the course rules prohibited in-ear headphones, Aftershokz had a display. In case you missed it, I'm pretty much in love with mine. I got to try on the new Trekz Air model is SO LIGHT! 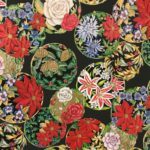 The piece that connects the two side is much springier and thinner, too. I didn't buy another pair (SO TEMPTED!) but only because I already have a pair of Trekz Titanium and I'm trying to be financially responsible. Trekz Titanium are great, but these Trekz Air are like half the size and weight, and sturdy too! 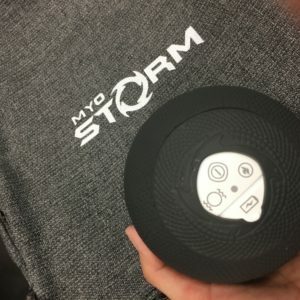 I got to play with the MyoStorm Meteor production model, and I think it's going to be pretty cool. 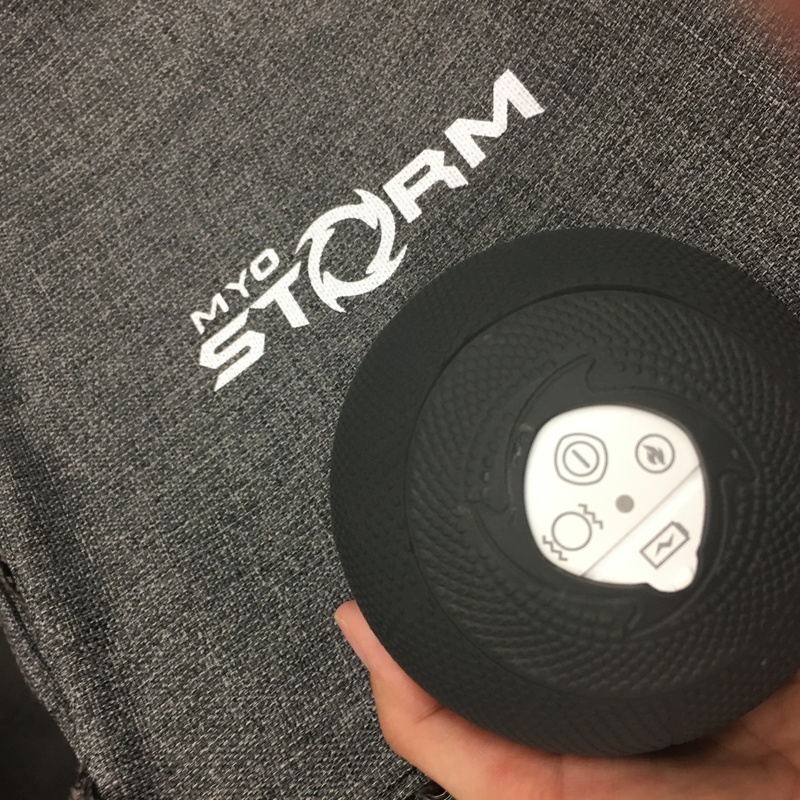 It's a vibrating, heating massage ball that can hit all sorts of spots your foam roller cannot. It's just under 4″, and will be great for feet and hands, too. Sound intriguing? 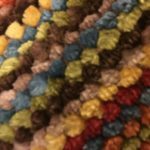 Sign up to learn when their KickStarter goes live using this link (which is an affiliate link). It reminded me of my TP Therapy Grid Vibe having a baby with the TP Therapy MB5 Massage Ball. Another thing that might be of interest to my peeps: a line of athletic supplements for keto athletes. It's called Metcon. I'm not keto, but this intrigues me; because if you're on a keto eating plan, but then bomb your body with carbs during a race or other event, of course your stomach is going to feel like crap. 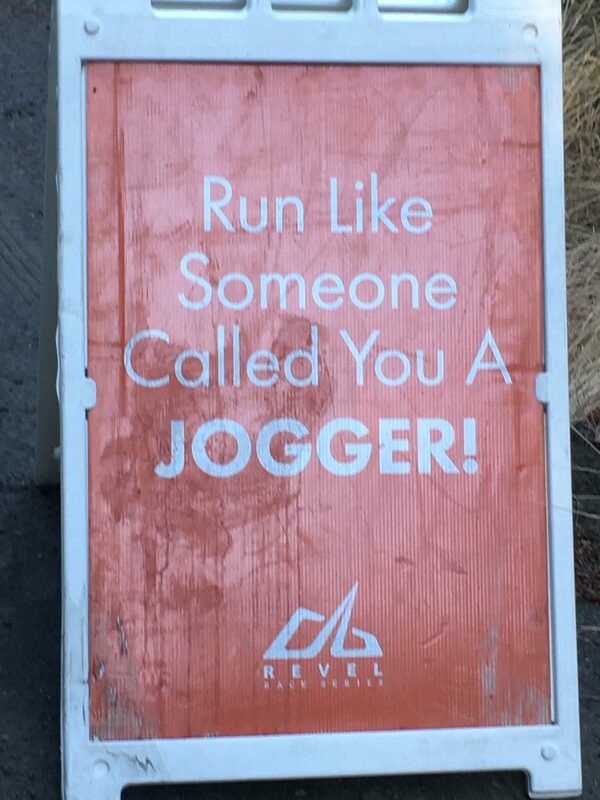 (Just like if you normally eat carbs and then suddenly stop and try to run a race.) Dan, the founder, was there at the expo to answer questions. The Metcon line has four products: Start, Power, L Carn, and Keto-Rx. The Keto-Rx product is the fuel. It has BHB salts, and MCT oil is the main fuel source. Mixed with water, it's a cloudy white color (no added colorands or other useless ingredients in this stuff). The advertised flavor is “natural strawberry,” but I thought it tasted more like a light coconut. 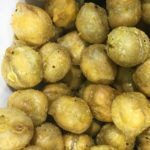 It's not overly sweet–to stay keto and paleo friendly, it is sweetened with stevia, not sugar–but it had a pleasant, slightly sweet taste. 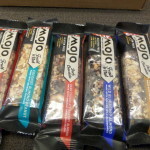 If I were a keto or paleo athlete, I would definitely use this. 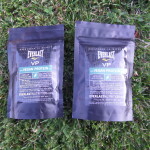 The products are made in the USA, gluten free, and free of banned substances (this last bit definitely matters to competitive athletes who are subject to drug testing, but from a quality standpoint, it should matter to you, too–unless you don't want to know what's in your supplements). On the way out of the expo there was a photo booth, and two background pictures, with a bevy of props and signs. Oh! I almost forgot. The expo also had a checklist in the app, where you had to get a code from each of the sponsor vendors. All who finished the list were entered to win prizes! When you've got a point-to-point course, shuttles are a critical component. Revel Mt. Charleston had two sets of shuttles, both of which were school buses. (That turned out to be fine, but wasn't what I was expecting; school buses don't have the suspensions to let me nap!) One set of shuttles left from the Sandy High School parking lot directly to the starting lines. Some folks chose to stay out near Mt. Hood, which is a gorgeous area, and Sandy was the designated parking lot. Separate shuttles took runners to the starting lines for the half marathon and the marathon start. Here I am at Oh My God O-clock. Why no apostrophe in the caption, WordPress? For a small extra fee, Revel also provided a shuttle from “downtown” Portland to the race (and back again). Separate full and half marathon buses loaded 2:30 a.m. to 3:00 a.m. at the Lloyd Center Courtyard by Marriott. Since I currently live about four blocks from there, this option was a no-brainer for me. I set out all of my race-day essentials, set my alarm for 2:00 a.m., and knew I'd have plenty of time to make it in the morning. So I did my best to keep my eyes closed and tell my body that really, I was sleeping, on the ride out to the start. When we arrived at the starting line, the sun was still in bed, and the moon shone brightly above the starting line. I carefully stumbled off the bus and onto the road, and followed the other runners up a dirt road and into a field. I have no idea what the deal was with the field, but it was mown and not filled with cow-patties, so good enough for me. There were plenty of porta-potties, and since the starting line was remote they were all fresh (bonus!). It was ridiculously cold and dark to be doing so, but after I used the porta-potties I diligently took out my sunscreen and sprayed on two solid layers. (It is easy to miss spots with the spray-on kind, and also important not to burn!) 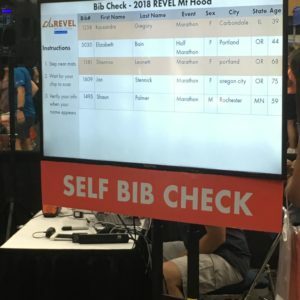 After they had dried sufficiently, I pulled on my beloved but slightly yellowed long-sleeved tee from the 2002 Great Columbia River Crossing, rolled up into my heat sheet like a little baked potato, and attempted to get a wee bit more shut-eye in the hour+ before the race. It's a little lonely being back in Oregon, since all of my crazy runner peeps are in California. At the same time, there are some benefits. 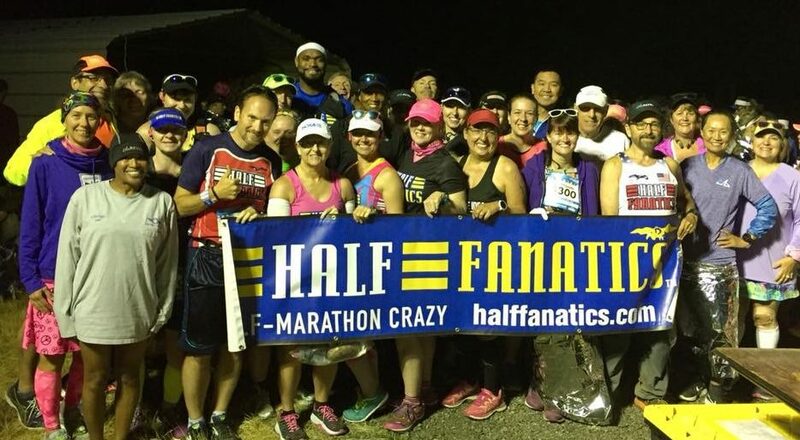 I'm closer to the founding location of the Half Fanatics and Marathon Maniacs, so there is a club photo before every race, even if it seems like a “small” one. At Revel, first we had the Half Fanatics picture. 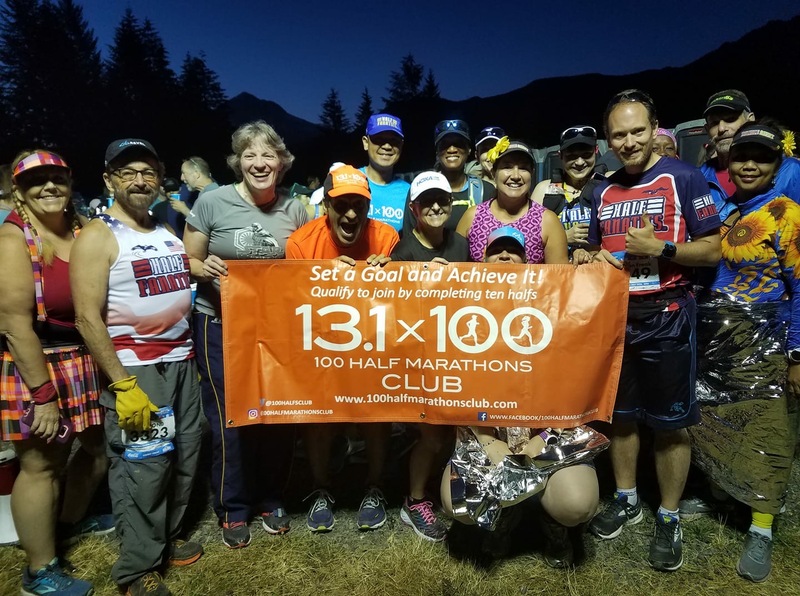 Then there was a banner swap and a personnel change, followed by the photo for the 100 Half Marathons Club, followed by the same and a photo for the 50 States Club. I'm not sure if the photos are a little blurry, or if the people were still a little blurry when they were taken, or maybe both? Seriously I am not a morning person. 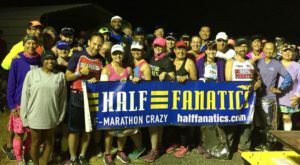 100 Half Marathons Club, reporting for duty! After the photographs I made one last porta-potty stop, tossed my heat sheet, and handed my gear bag over to the truck. Then I joined the other runners in the short walk back to the road. Since I charged my watch but oops left it at home, and couldn't use Vi because in-ear headphones were banned on the course, there wasn't much to do to get ready to go. At o'dark-thirty, we didn't have any amplification, so I don't know if someone sang the National Anthem or not. We had a sunny, gorgeous day, and river views, too! The majority of the course was on what I'd call rural residential streets. The roads were paved and in excellent condition, with a variety of dwellings that ranged from a full-time residence, to a fishing retreat, to an artist's studio, to the family cabin, and everything in between. We had an entire lane closed off for our use with cones, and there were volunteers to direct traffic at every intersection. The vast majority of the course was shaded, which I definitely appreciated once the sun came up. (I did have a mini sunblock spray in my pack, which I reapplied at mile 11.) Due to the way the few roads are in this part of the world, it wasn't really possible for spectators to show up at random points on the course. That made me kinda sad, because there were no puppies to pet. I did see one absolutely gorgeous dog, but he was absolutely NOT down with this constant parade of people (which might be the first time he's seen a stream of runners down “his” road). The other dogs along the course were largely warning us to stay the eff out of their yards. I did see two itty-bitty kitties, but I didn't want to encourage them to hang out on the road so I waved and moved on. It is a horse, made of horse shoes! 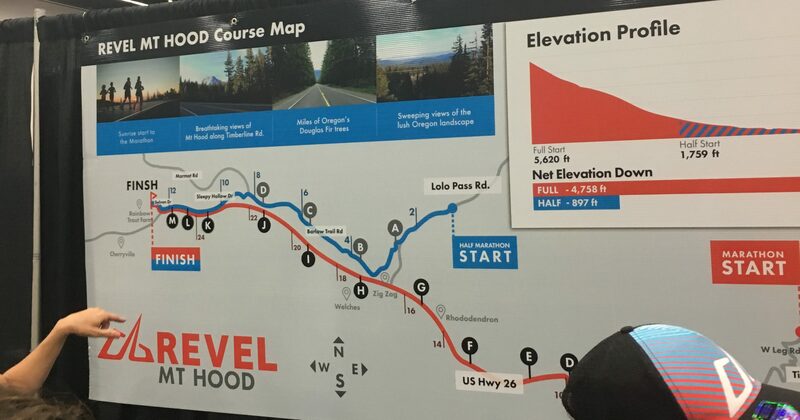 At some point after mile 10, the course joined the marathon course on Highway 26. (I understand the marathon ran quite a bit of their course along Highway 26.) This wasn't awful, but it wasn't fantastic either. For some of the highway segment we were running on a generous shoulder, and for the section that had the smaller shoulder, we had one of the east-bound lanes closed off for our use. It was definitely safe, but Highway 26 is the major east-west road for a decent part of the state, so there were trucks and all manner of traffic whooshing by. I was glad that was limited to about two miles of the course, after which we turned down the road towards the finish line. This, again, was a shaded, residential type street area, though it wasn't a major thoroughfare like the earlier part of the course. There were also more people out cheering in this area, since it was possible to walk in from the finish line. A Revel finish line, in my experience, has always been great. There's the usual clock, timing mat, photographer, announcer set-up. Oh, and did I mention that Revel gives all the runners FREE photos? True story. A day or two after the race, I had access to 30 photos with me in them (and that's before I look at the mob scene photos, or the albums with runners who can't be identified by their numbers). As a not-so-fast runner, I came in with a slow dribble of runners and not a mob, so I was announced as I crossed. After grabbing my medal, there were volunteers to hand me a bottle of water and a chocolate milk protein shake. Then I slowly made my way over to the pizza table and grabbed a slice, and a donut, and a diet Coke (all part of the official finisher food). There were two backdrops with props and signs for photos (either yours, or via the photographers taking the free photos). The results tent printed out a card for each finisher, and those with Boston Qualifying times got a special luggage tag announcing it. The age group awards were additional charms to put on the event medal. I really like how the ribbon is looped on, giving the medal a distinctive look. Soon it was time to shuffle over to the shuttle for the ride back to Portland. I had cleverly tucked my oofos into my checked bag, so my feet could chill as I stood and sat and waited for the bus. There were fairly long lines for the shuttles back to Sandy, which ran on a loop (pick up, drop off, repeat). The location wasn't conducive to running more buses (you couldn't put two on the roadway on opposing sides and still have space for running safely). 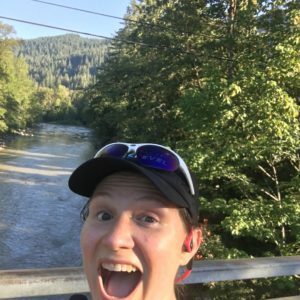 The bus back to Portland left at the top of every hour, so I had some time to chat with other runners. Here comes the PSA for this blog post: if it has been more than two years since you last took a CPR and first aid class, please, go sign up for a class RIGHT NOW. The Red Cross has classes all over the country, many days and times–choose one that works and go sign up! On our bus on the way home, I was again trying to sneak in some nap time. Suddenly there was a loud, “Is there a doctor on the bus?” Fortunately, there were two medical professionals on the bus. 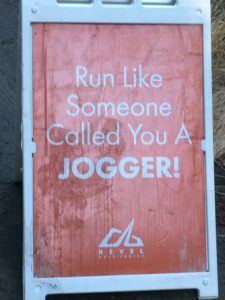 I don't want to invade the privacy of the runner who had the problem, but I will say both loss of consciousness and vomiting were involved. 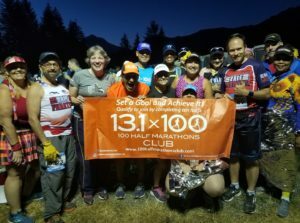 As the two medical pros took over care, the other runners got the bus driver to pull over, and another runner called 911 to get an ambulance. 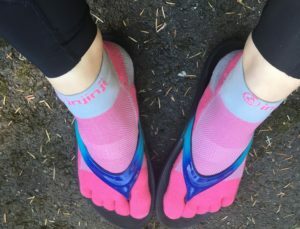 When the EMTs arrived, it seemed like everything was fine–the runner had a family member with them, and the two left with the EMTs in an ambulance. Frankly, when you don't know what's going to happen, a medical emergency can be a little scary. But if we didn't have medical professionals on the bus, I knew what to do. When I heard the call for a doctor, my brain immediately turned on and I snapped to attention. Again, we were very lucky to have two medical professionals on the bus who jumped into action. But if they hadn't been there, would YOU know what to do (beyond call 911, obviously)? If you were the one experiencing the medical emergency, wouldn't you want someone on the bus who could take control of the situation? Yup, me too. 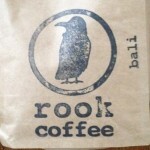 I was impressed with the inaugural Revel Mt. 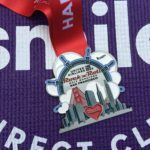 Hood half marathon, and will definitely sign up to run next year. (If you follow that link, you're joining my team, Train With Bain.) In fact, I'm thinking about running ALL of the Revel races next year. After all, if Mt. Charleston and Mt. Hood are both great, I bet the others are too. If you are looking for a net-downhill (note that's not ALL downhill!) race with a rural,, pretty course that's mostly in the shade, you should definitely consider Mt. Hood. If you don't live in the area, you can either rent a space near Sandy or Mt. 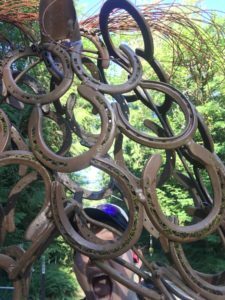 Hood and use the rest of the weekend for fishing or a cabin retreat, or stay in Portland and explore the city after the race. See you June 29, 2019? 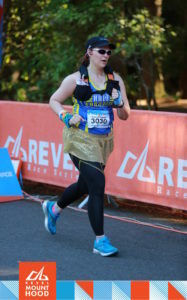 One of my FREE race photos from Revel Mt. Hood!